What if I told, your skills can actually make you money? Surprisingly, there are hobbies that make money. A hobby is something that we like to do or have a passion for. It is not something that we do in our leisure time but it is more of a thing that we create time for. You can make money from your hobbies, especially doing something that you absolutely love to do! Yes, you can make a good side hustle of your hobbies. There are many people who have taken their money-making hobbies to be a full-time career. Whatever be it, there are still so some ways you can make money without spending a penny. Hobbies are considered to be a great way of supplementing your income. Who wouldn’t love to earn money by doing something that they love? Today, you can get plenty of opportunities on the net through which you can make good use of your hobby to generate some extra income for yourself. If you are really good at it, you can even make your main source of income as well. 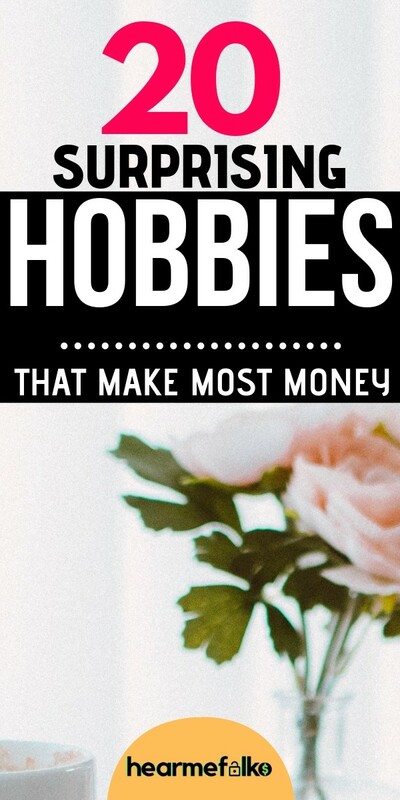 If you are looking for hobbies that can help you make money, you are in the right place. All credit goes to the internet that has made it possible for people to make money doing just about anything. Whether it be cooking or gaming, you can get paid for anything that you love to do. What a great time to be alive, isn’t? After a lot of research, we have shortlisted 20 of the best hobbies that can help you earn a good income. Go through the list, if you are interested to know. You may have no idea but there are tons of interesting things that you can do and even get paid for it. I have listed only the 20 best hobbies, or else you can find more such hobbies on the web that will pay you a good amount. Here take a look at the list. Whilst, some hobbies are an easy source of extra money some are highly lucrative and can make a good side job. In this section, I’ve covered hobbies that pay for doing what you already do or can do in your spare time and need no additional work. This is perhaps the easiest thing you can do online to earn extra money. Sad that you aren’t getting paid for your opinion? Or your opinion doesn’t strike someone’s interest? I’ve something interesting to share. In reality, you can actually get paid for your opinion and the best part is you don’t even have to deal with uninterested people. Many reputable companies and popular brands are waiting to hear from you. You can find a number of such reward sites on the web. But, I’ll make it easy for you. Here’s a quick list of the most popular legitimate paid online sites. You can simply sign up for them and offer your valuable advice whenever feasible. It hardly takes 10 minutes for you to complete a survey. Also, you can do the task even while traveling or watching TV and get paid up to $50 for each survey. Ready to generate some extra income sharing your voice? Vindale Research – Get $2 sign up bonus, up to $50 per survey, $5 referral bonus and lots of other incentives. Sign Up here! MyPoints – Get paid up to $50 per survey + $5 bonus after first 5 surveys. Survey Junkie – This BBB accredited A+ rated survey site pays up to $45 per survey. It also has an amazing referral program to earn additional bonuses. Last month, I made $61 on Swagbucks. That’s a lot of money for just surfing the web, watching short videos, and referring it to my friends 😉 I haven’t even tried the various other options available on this site. You can make a lot more if you can try the rest of the options. Swagbucks and Inbox Dollars pay you for watching videos, playing games, and taking online surveys. Swagbucks also pays for surfing the web and shopping online. Chance are you’ve already heard of these sites. They are pretty popular, legitimate and can help you start earning today. Earn a free $5 signup bonus just for joining. ➡ Don’t forget to verify your email to claim your gift. Inbox Dollars: Inbox Dollars is yet another highly legitimate rewards site that works on similar grounds as Swagbucks. You get rewarded for everyday mobile and online activities and that too in real cash rather than points. Click here to Sign up for Inbox Dollars – US. Sign up for Inbox Pounds right here, if you reside in the UK. If you have strong knowledge about investment then you can choose to invest money in funds and shares. This can actually fetch you a very good amount of income for yourself. The Motley Fool helps millions of people attain financial freedom through their website, podcasts, books, newspaper column, radio show, mutual funds, and premium investing services. If you are a first-timer, it is advised that you start with a small amount and do it under the Motley Fool’s guidance. They have been a trusted resource for several years and popularly known to help you invest better and gain good returns. ➡ If you’re thinking of starting small, another great option would be “ACORNS“. 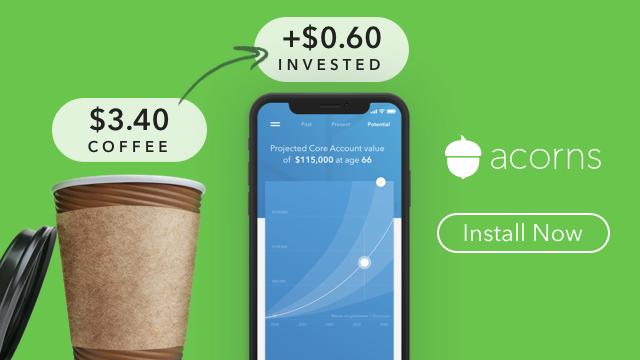 Acorns is a spare-change savings app that makes investing easy. Over 3 million Americans use Acorns to help set aside a little from their everyday purchases. This micro investing app helps people save and invest money for the future without you even realizing. Tutoring might not be everyone’s cup of tea. If you are an individual who loves it, this is for you! Teaching English online is a reputable job that you can take up online and get paid a good amount for it. This is basically online tutoring. All you need to do is sign-up for an online teaching site like VIPKID and teach English to Chinese kids (4yrs and above). This can be the best option for college students, stay at home moms, dads, and side gig lovers looking to generate some income by doing something good for society. You can make a full-time income but you have to be willing to work late nights and early mornings, especially on weekends. Pay ranges between $14-$22 per hour. Most people I know make $20/hr. So to make $2000/month you’d need to work roughly 25 hours per week. However, taxes are not taken out so you have to account for that as well. Meet the above requirements? Go ahead, Click here to Apply for VIPKID. If you love to prepare creative dishes, you should not let your talent go to waste. There are multiple ways you can earn money with your cooking or baking skills. For example, you can create a food blog, launch e-books for popular recipes and sell them to your readers. Here’s a step-by-step guide on: How To Create 10 e-books Per Week On Autopilot And Make Passive Income Every Month! If writing a recipe book seems tough to you, you can even shoot cooking videos and share it with your viewers to earn money. There are so many options that you can go about. Do you love taking photos as a hobby? If you have the skill to capture stunning photos then this could be one of your options to earn money. This is the perfect option for all the people who have a passion for photography. Click some good photos and sell them online for a good amount. Humans are visual creatures – we love to enjoy the sight of beautiful stuff. There are a number of sites that will pay you a good amount for your photos if they like it. Put your skills to some use. Take out your camera and start clicking. Can you believe that you can earn money just for traveling to exotic destinations for free? Yes, this is no joke. There are many traveling companies that offer you free tours to beautiful places and also allow you to stay for free just for a review in return. All you need to do is write a review of your experience and the place and you will not only get paid for it but also get to travel to some of the beautiful places as well. However, there is one small catch. In order to grab more of these sponsorships, you’ll need to have a personal blog. So set-up a travel blog and upload some of the best articles written by you to attract these travel companies. Did you know that you can get paid for shopping? This is a dream come true for all the shopaholics out there. You can choose to become a mystery shopper for a company. Performing mystery shops is a great way for you to make additional income while helping companies to enhance their level of customer service. BestMark is one such BBB accredited company that offers 10,000-plus mystery shop assignments each month across more than a dozen industries. The company will pay you for giving them reviews about their products and services. Not just that, they can also offer you free gifts as well. This means that you are getting paid for what you love to do the most. If you love shopping which you surely do, sign-up to become a mystery shopper and earn some extra income for yourself. Check out the minimum criteria to become a mystery shopper right here. If you love to voice your opinion and thoughts on social media and also have a good number of followers, you can earn a good income from that. All you need to do is open a page on any of the popular social media accounts and start posting about any particular topic. As you gain more followers and people start trusting you, you can start posting about various products and services. Every time someone clicks on the product and make a purchase, you will receive a commission. This may be a bit time consuming but it can work great for you. Do you love to game? Did you know that you can earn money by playing games? Well, everything is possible in today’s times. Gaming is one of the most profitable hobbies. There are two ways through which you can earn through gaming. You can either make a game of your own and upload it on Google Play with monetizing ads or try the games made by different companies. There are many companies that pay gamers to test their games and point out the problems in it. However, for that, you need to have good gaming knowledge. As discussed before you can get paid to play games with platforms like Swagbucks. Online courses are very much in demand nowadays. I’ve seen people making around $100,000 per month, and not to forget it’s a great source of passive income too. If you have good knowledge of any particular topic you can create a short 10 to 20 minutes video and upload it on the web. If your course is in-demand, there’s no looking back. There are many popular platforms out there where you can host your videos. The most popular ones are Udemy, Skillshare, Coursera, and Teachable. All you need to do is shoot a series of short videos or prepare slides and upload them to earn a decent income. This Complete Guide to Selling Courses on Udemy will help you find the perfect course topic for you and how to discriminate whether it will be successful or not. Do you wish to set-up a small online business of your own? Do you wish to sell well online? Well, you can surely do that by joining the sites that will allow you to sell your products on their platform. Today, the internet has made it easy for people to sell anything they want online. Now the question of what will you sell? Well, there are so many options to choose from. You can sell handcrafted goods, furniture, beauty products, electronics, clothes, etc. All of these items are in great demand and thus, you can earn a very good profit from it. Amazon, eBay, and Craiglist are a few amazing platforms to sell used/new products online. Is writing your passion? This is one of the best options to make money sitting at home. Become a Blogger – Write about a topic you are passionate about and make money on the go. Freelance Writer – You get paid to write for bloggers and small business owners. Learn how to find and pitch to clients. Sponsored Posts and Reviewers – Get paid for product reviews and articles for magazines and publications. Finally, professional writers, novelists, and technical writers that need no introduction. Freelancing offers amazing flexibility and there is always a perennial demand for writers. Nowadays, there are numerous sites to help you earn a decent income as a freelancer. You can work when you want and also choose the amount of workload you want in a day. There are people who even make freelancing as their full-time career. Gina Horkey runs her own freelance writing business and started earning $4,000 per month on the side of my full-time job within just 6 months. She coaches people on how to build a freelance writing career in just 30 days. Most of her students now left behind their 9-5 jobs and make a full-time income from home! 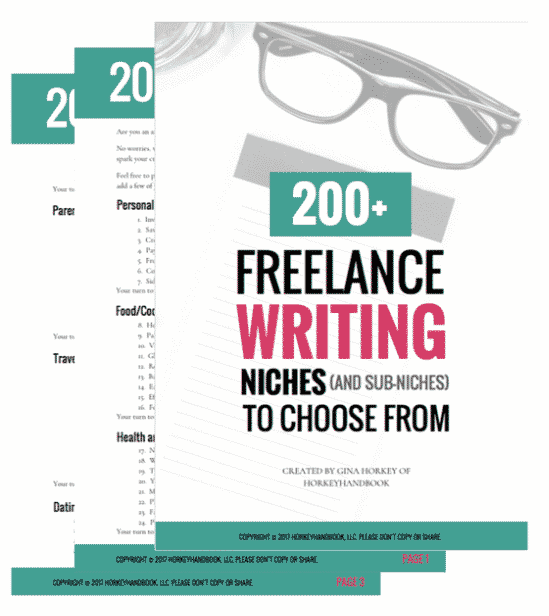 Download this FREE copy of 200+ writing niches to find yours’ and get started with ease. Pursue your writing career with utmost confidence and let Gina take the lead to help you achieve success with her course – 30 Days or Less to Freelance Writing Success. Graphic design is more of a professional skill but can still be categorized under hobby list. If you are a trained graphic designer, you can earn money in various ways. It’s fine if you have a permanent job but that doesn’t mean that you cannot have a side job to earn extra income. Many online entrepreneurs out there are ready to pay huge for branding purposes (designing graphics and logos). Reach out to them and pitch your services and see the magic happen. Do you love capturing everyday moments in your camera? Is video creation your hobby? Then this monetization model is apt for you. You can upload original enticing videos (dance/art videos, tutorials, etc.) and earn money. Youtube is a well-known platform of all. But, there are many more like Vimeo, Video on Demand, The Vault, etc. For more details about video monetization, check this out. Create a YouTube Channel, enable monetization, and connect it to your Adsense account to start making money from advertising. Keep in mind that, YouTube accepts any channel for monetization after it crosses 10,000 views. You can also tap into other sources of income for your videos, but they all need a solid viewership and subscriber count. The more viewers you get the better money you make. Make sure your videos are engaging enough to enhance the watch time and earnings per view. This is the perfect job for the ones who enjoy driving. All you need to do is drive people around the town and get paid for what you love to do the most. You can work during the weekend or whenever you have free time. Uber is a ride-sharing app is the go-to place, opening up more possibilities for riders and more business for drivers around the world. Click here to get started with Uber. No time to drive people around? 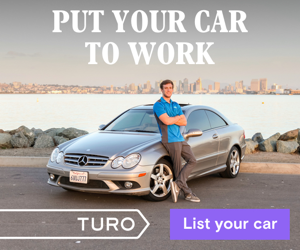 Instead, List your car on Turo. Turo is a car rental marketplace where travelers rent cars from local hosts around the world. Find out how much your car could earn for you with their calculator. Turo hosts can cover their payments by sharing their cars just nine days per month. If you are skilled in making some kind of crafts like jewelry, handmade goods, and artwork, you can make good money out of it. You can sell your handmade stuff on the net to generate income for yourself. You can either sell your products through a shopping site or even post pictures on social media sites from where people can order the goods. There are so many people selling their handmade good through social media platforms. This is a good way of earning money provided that you have the skill to be a great craftsman. If you are really good with your music skills then you have plenty of opportunities to earn money. You can post your music videos online and earn money from it. Not just that, but you can even compose music for small projects and get paid for it. Don’t let your talent go to waste. You have plenty of scopes to put it to good use. If you have the love for planting flowers, you can make a good business out of it. All you need to do is turn your passion into a business. Plant and grow flowers and then sell them to earn a good income. This is one of the best ways to earn some extra income. This option is just perfect for homemakers. All the above-mentioned hobbies are a great way of supplementing your income. Learn to turn your hobby into a persistent source of income and make good use of it. Whether it be shopping or traveling, you can earn money by doing anything these days.